The whole point of a vacation is to enjoy yourself and relax, right? However, planning for a vacation can sometimes paradoxically increase your stress levels. Sure, it is exciting figuring out everything you want to do for your trip, but it can also be overwhelming. That’s why we’ve done the work for you! Save yourself some time, and take a look at our sample itinerary for a fun Poconos weekend getaway. The Pocono Mountains are a fantastic destination for a family weekend getaway. There are so many fun things to do unique to the area, both natural and manmade. Mountaintop Lodge welcomes children of all ages, and we can provide a pack and play upon request—check our policies page for more information! 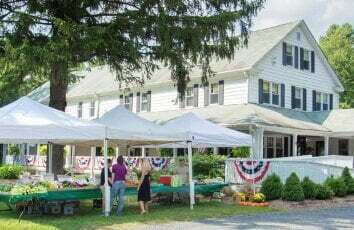 Take a look below at what your family trip to the Poconos could be like! Arrive at Mountaintop Lodge and drop your bags off in your cozy quarters. Step outside on our spacious front porch and take a deep breath of fresh mountain air—you’ve arrived, and now it’s time to relax and have fun! 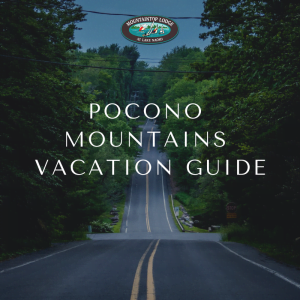 Depending on how tired you are from your trip, you can get started exploring the Poconos, or take it easy by not venturing too far from the lodge. Guests of Mountaintop Lodge gain free access to all amenities at nearby Lake Naomi Club, just a short drive down the road from the lodge. 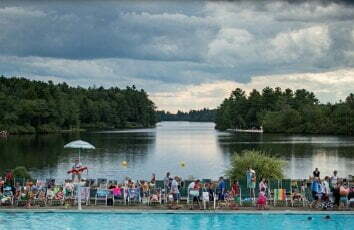 That means you can enjoy the seven different private Lake Naomi beaches, the indoor or outdoor pools, the outdoor sports courts, all the facilities at the Lake Naomi Community Center, fishing, boating, a climbing wall, any fun events that are happening, and more! Grab dinner at the club’s onsite restaurant, or head into town to pick your choice of family-friendly dining. Van Guilder’s Jubilee Restaurant is a local favorite! Return afterward to the lodge to settle in for the evening. If the kids are still restless, we have plenty of DVDs, books, board games, and Wi-Fi throughout the building. Wake up completely refreshed after an evening in your soft, comfortable bed to the aromas of fresh coffee and a homemade breakfast. Head to the Main Dining Room downstairs for a delicious cooked-to-order breakfast. You’ll have your choice of sweet or savory menu items, which vary seasonally. We are happy to accommodate any dietary restrictions—just give us advance notice! After you’ve fueled up, you’ll have plenty of energy to go out and explore! There are plenty of kid-friendly things to do in the Poconos—it all depends on what you and your kids want to do. If the weather is nice, your kids will love hiking through the forests to views of thundering waterfalls! Or, you can spend some time tubing down the Delaware or Lehigh River. For a unique thrill, head to an aerial adventure course! There’s plenty of family-friendly entertainment in town, too. One of our favorites is the Lehigh Gorge Scenic Railway! The best part is that when you stay at Mountaintop Lodge, you’ll be just a short drive away from all kinds of entertainment. Wake up early to pack in as much fun as you can before checkout at 11! Or, take it easy and relax in the lodge, in your room, or at the Coffee Shop. Enjoy another delicious breakfast before you hit the road (albeit reluctantly!). 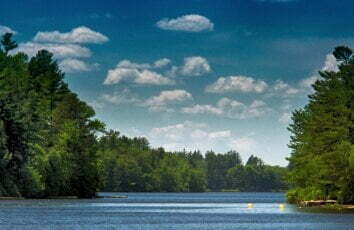 The Poconos hide just as much romance among their forested peaks as they do family fun. The idea of a romantic escape to the Poconos might bring to mind visions of gaudy resorts, but if that isn’t your thing, don’t worry! A romantic getaway to the Poconos doesn’t have to involve heart-shaped tubs. Instead, it can be a serene, intimate retreat, filled with relaxation and beauty. Between spectacular scenic hikes and charming wineries and restaurants, there are all kinds of ways to spend quality time with your sweetheart. 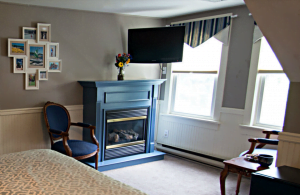 You’ll find that Mountaintop Lodge is far from typical, and not just in the fantastic amenities we offer. 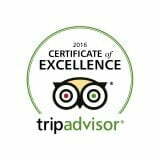 We strive to make your stay enjoyable and comfortable, and you can expect to be met with friendly faces from the moment you arrive. Where you stay sets the scene for the kind of vacation you’ll have, and our lodge offers a peaceful alternative to the hectic atmosphere found in the nearby resorts. 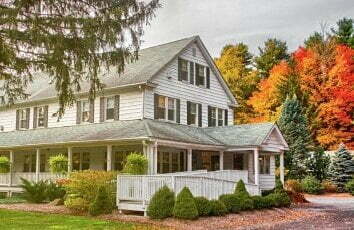 Take a look at our inviting accommodations, and book your Poconos weekend getaway today!